Lost locations and hidden treasures are a tried and true formula for action adventure. Mixing in different ancient histories as a context is one of many ways of keeping it more or less fresh between different quests and adventurers. Indiana Jones is one of the most iconic in recent history, but there are plenty more and as long as the troupe doesn’t grow stale there will continue to be more. Adam’s Venture Episode is a venture in this classic formula and by designing it as an episodic series it leaves it open to smaller more focused games than a full game that may attempt to cover too much or not enough. Setting it in the 1920’s fits the pulp novels that coined the genre. So where exactly does the first episode of Adam’s Venture lay between Indiana Jones and pulp novels? Adam’s Venture Episode 1: The Search for the Lost Garden tells the story of Adam Venture, less searching for the lost Garden of Eden, but more trying to enter after they have already found it. He is joined by is girlfriend Evelyn, oh ho, Adam and EVElyn out for the Garden of Eden; the professor; and his dog, Digger. But, as stated before there isn’t any searching for the garden, thy know exactly where it is, it’s simply getting the door open that’s the kicker. Adam Venture as a character is kind of a jerk, the first conversation with his girlfriend can make one wonder what she ever sees in the guy. Come to find out that may be the point. Adam is this hot shot adventure stud and he completely buys into himself, to the point where the others can blatantly mock him and he just takes it in stride. In fact it really works, a sort of parody of the other adventurers that get swooned over. Adam is flawed and he’s great that way. Inside the caves and tunnels Adam must work to find the pieces that will open the door to the garden, but trying to prevent him is an ancient evil, represented by a cloud of black smoke because what other form could ancient evil take? Adam must dodge traps, avoid the evil, and solve numerous puzzles to get back with the pieces and open the door back to Eden. The game is truly good looking. The characters are great to look at and have an excellent aesthetic to them that pops from the scenery, without seeming out of place. 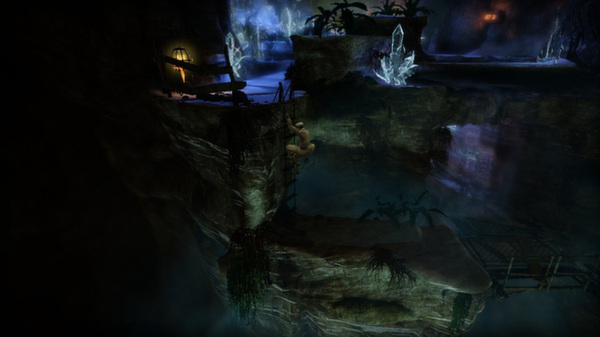 The scenery is also beautiful just to look at and for a game that is almost exclusively inside a cave, the environments have a solid variety, from sandy, to crystalline, to water. There are a few issues however, though luckily primarily minor. The opening and closing cutscenes are a bit over sepia toned, to the point where it almost seems like the options need to be changed until the gameplay starts. 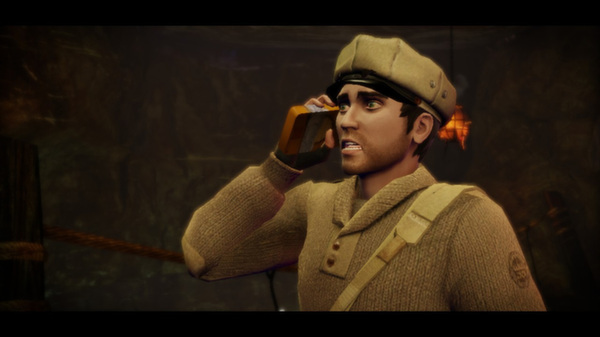 Besides that, the only real other negative is that Adam Venture’s cap has no under texture, which wouldn’t seem like a problem except he takes it off when moving while crouched. Several tunnels have him crouched and very close to the camera, so it’s noticeable that one can see through it’s bottom. Nitpicky? A bit, but pretty good that those are the only real negatives. The soundtrack is very well done and nice to listen to for extended periods without going crazy. It includes a nice balance of instruments and every piece fits the area for which it appears. It isn’t a surprise that one can actually purchase the soundtrack for the game, as it is very high quality work. The voice acting on the other hand is not quite up to par. Dialogue is at times cheesy and sometimes the lines are read in a strange cadence that doesn’t necessarily feel natural. The cheesiness of the dialogue can kind of grow on you as the game progresses, at times thinking of silly jokes will result in them actually being said or some variation there of. For the most part the game focuses on puzzles over everything else, which is actually a good thing. 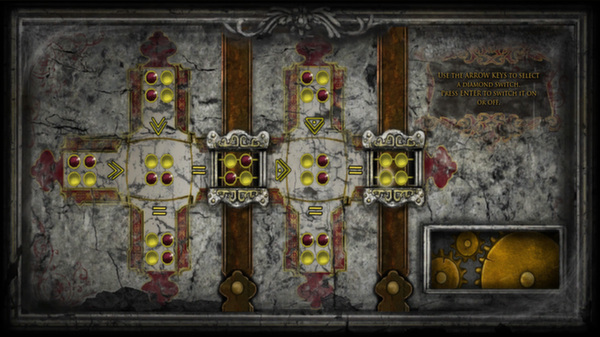 The game isn’t terribly long and in fact only a few puzzles are repeated, albeit at raising difficulty. There is a bit of platforming, but it is decently straight forward. The focus on the puzzles makes it easy to get through in a single sitting, and none are overly difficult in how much brain power needed to solve them. 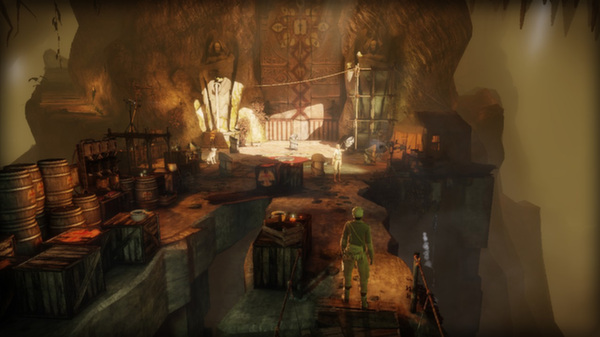 There’s a small bit of walking and exploration, with each puzzle area having one secret that the player can find. The game totes its motion capture and for the most part it is well done, though there are a few issues with it. Attempting to crouch while already moving causes the animation to play twice, which is small, but fine. What isn’t however is an issue the player animations causes one of the timing puzzles. A room requires 4 stands to be ignited at the same time and figuring out the order isn’t hard. The hard part is actually lighting them in time. Missing the just correct position for igniting, causes Adam to turn to face the correct position, step in the correct position, then turn to face the stand, which can be overly time consuming. Numerous attempts left the first one going out while Adam was re-positioning on the last; overall taking way more tries than it should require to get the just right positions and complete the puzzle. Ultimately, this is a very well put together game that may be of consideration if you enjoy puzzles and are willing to give them a couple hours of your time. $5 is a great price and is well designed for kids to play and enjoy too. What few issues it has are buried beneath the high quality, which definitely creates interest in the later episodes. All things considered anyone only interested in the puzzles can always play with the sound off.